We are gearing up for Winter Fun here in Big Bear, but there is still time to explore Big Bear before the snow flies. Wander the quaint streets of the Village and enjoy hundreds of unique shops, find the perfect restaurant or enjoy some live music. Sip a coffee or hot chocolate while relaxing by one of the outdoor fire-pits and take in the beauty of the mountains in the fall. 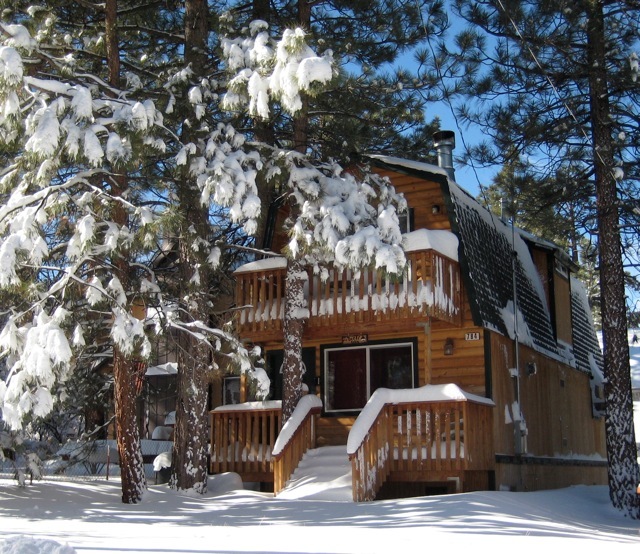 Let RS Vacations provide you with the perfect cabin for your Big Bear Escape. We offer clean, comfortable cabins with the very best amenities and we pride ourselves on EXCEPTIONAL CUSTOMER SERVICE! You will not be disappointed! Our homes are filling up fast for the upcoming Holiday Season, so be sure to check out our cabin selection at RSVacations.net and book a Big Bear Cabin today! The American Legion Big Bear Post will be hosting a Veteran’s Day Ceremony at the Big Bear Convention Center. Doors open at 10:30 am and ceremony begins at 11:00 am. The American Legion’s Color Guard will post the colors of each of America’s services, and veterans will be invited to stand with the flags of their branch of service. All Big Bear Valley residents are invited to join with the American Legion and city officials in this annual recognition of America’s veterans. For more information, contact the American Legion at 909-866-4845. Playing at the Big Bear Lake Performing Arts Center for 11 performances from November 18 thru December 4, CATS will present the classic Andrew Lloyd Webber/ Tim Rice musical, “JOSEPH AND THE AMAZING TECHNICOLOR DREAMCOAT” Lyrics by Tim Rice and Music by Andrew Lloyd Webber. Directed and staged by Michael Reno. Joseph and the Amazing Technicolor Dreamcoat tells The Biblical saga of Joseph, the boy blessed with prophetic dreams, and his coat of many colors comes to vibrant life in this delightful musical parable. The 4th Annual Big Bear Turkey Trot consists of 3 mile, 6 mile, and 9 mile Road Runs on Thanksgiving Day with Start/Finish line located at Meadow Park. This is a FUN event for the whole family. The run course is a relatively flat 3 mile loop through the neighborhood of Eagle Point, with 6 mile runners completing 2 laps and 9 mile runners completing 3, making it easy for all abilities to participate. The 9 mile race starts at 9:00 am, 6 mile starts at 9:15 am, and 3 mile starts at 9:30am. Cost of Admission – $20 for Adults, $13 for children 12-5, Under 5 are free. Let the shopping season begin! The 32nd annual Mountain Christmas Boutique kicks-off the holiday shopping season at Big Bear Lake. This year’s arts and crafts show once again takes place over the Thanksgiving holiday weekend, November 25-27 at the Big Bear Lake Convention Center and features 40+ vendors, FREE arts & crafts for children, and holiday libations and food. Taking place for three decades, the Mountain Christmas Boutique is the largest holiday arts and crafts show in the mountains. With several returning favorites, the show also features new crafters each year. This year children will have the opportunity to make their own holiday horseshoe art using actual horseshoes. Also, holiday libations and a variety of show foods will be offered on site. The show offers a quaint shopping experience featuring handmade and one-of-a-kind items and a variety of collectible and unique gifts. Crafters and artists from throughout the Western United States converge in Big Bear Lake for the holiday weekend. From wire-wrap gem jewelry, to handmade hats and scarves, to homemade jams and oils, to personalized ornaments, to vintage clothing, there are gifts available for every taste and every budget. Holiday items include Christmas wreaths, handmade Santas, and holidays treats. The Mountain Christmas Boutique is located at the Convention Center at Big Bear Lake on the corner of Division Drive and Big Bear Blvd. Doors open at 10:00 a.m. daily with the shopping continuing through 5:00 p.m. Friday and Saturday, and 3:00 p.m. on Sunday afternoon. Admission is $3.00 for adults, $2.00 for seniors and FREE for children 12 and under. Sunday is Local’s Day with FREE admission for all Bear Valley residents (I.D. required). For additional information, call (909) 585-3000 or visit http://www.bigbearevents.com. Come and Enjoy the Festivities at Santa’s Grand Entrance in the Village. Entertainment starts at @ 5:00 PM and Santa and Mrs Claus will arrive in his sleigh at @ 6:00 PM. Santa will also be at the Xmas Tree Lot every Weekend from 10-4 pm until December 24th. When The English Beat (known simply as The Beat in their native England) rushed on to the music scene in 1979, it was a time of massive social and political unrest and economic and musical upheaval. This set the stage for a period of unbridled musical creativity, and thanks in large part to the Punk movement and it’s DIY approach to making music, artists like The Beat were able to speak out and speak their mind on the news of the day, as in “Stand Down Margaret”, things that mattered to them and the youth culture, as in “Get A Job”, and universal matters of the heart and soul, as in their classic hits “I Confess” and “Save It For Later”. The Village of Big Bear Lake presents Christmas in the Village every Saturday and Sunday up to December 24th. Visit Santa and Mrs Claus at the Christmas Tree Lot from 10-4pm at the Corner of Pine Knot Blvd and Village Drive as well as all the shops and restaurants throughout the Village that will be open all day into the evening. Every Saturday and Sunday from 10am to 4pm from November 26th until December 24th. The Big Bear City Fire Department will be hosting the Annual Christmas Tree Lighting Ceremony on Saturday, November 25, 2016. Everyone is invited to join the festivities starting at 5:00 p.m. The switch will be flipped to the tree lights promptly at 5:30 p.m.
For additional information, please contact the Big Bear City Fire Department at 866-7566. YOU ARE INVITED TO JOIN THE PRESENTING CHOIR. The choir is open and non-auditioned. All positive, enthusiastic people are welcome to join regardless of ability. Los Lobos were already East L.A. neighborhood legends, Sunset Strip regulars and a Grammy Award winning band (Best Mexican-American/Tejano Music Performance) by the time they recorded their major label debut How Will The Wolf Survive? in 1984.Although the album’s name and title song were inspired by a National Geographic article about real life wolves in the wild, the band—David Hidalgo, Louie Perez, Cesar Rosas, Conrad Lozano and Steve Berlin—saw parallels with their struggle to gain mainstream rock success while maintaining their Mexican roots. Perez, the band’s drummer, once called their powerhouse mix of rock, Tex-Mex, country, folk, R&B, blues and traditional Spanish and Mexican music “the soundtrack of the barrio.” Three decades, two more Grammys, a worldwide smash single (“La Bamba”) and thousands of rollicking performances across the globe later, Los Lobos is surviving quite well — and still jamming with the same raw intensity as they had when they began in that garage in 1973. The Cave is a new, intimate music venue in Big Bear that promises to bring you up close and personal with its performers. Doors open at 6:30 pm Concert starts at 8:30 pm. Call or visit website for ticket information.